Sam Elling works for an internet dating company, but he still can’t get a date. So he creates an algorithm that will match you with your soul mate. Sam meets the love of his life, a coworker named Meredith, but he also gets fired when the company starts losing all their customers to Mr. and Ms. Right. When Meredith’s grandmother, Livvie, dies suddenly, Sam uses his ample free time to create a computer program that will allow Meredith to have one last conversation with her grandmother. Mining from all her correspondence—email, Facebook, Skype, texts—Sam constructs a computer simulation of Livvie who can respond to email or video chat just as if she were still alive. It’s not supernatural, it’s computer science. Meredith loves it, and the couple begins to wonder if this is something that could help more people through their grief. And thus, the company RePose is born. The business takes off, but for every person who just wants to say good-bye, there is someone who can’t let go. 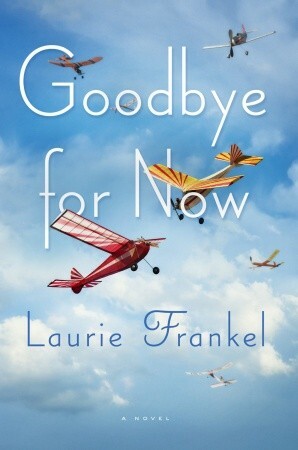 Goodbye For Now is mainly set in Seattle, Washington but setting isn’t Ms. Frankel’s main focus. She rarely gives detailed descriptions of the characters’ surroundings. Only in the later chapters her writing becomes more pictorial and when it does, many things are left to the reader’s imagination. Either that, or the author expects the reader to know about the geography of Seattle. But I didn’t mind, because setting isn’t that important in this novel. The characters and the story are what make it worth reading. The three main characters are Sam, Meredith and Dash. The reader sees almost everything through Sam’s eyes. He is a very likable character with a great sense of humor and is therefore easy to identify with. Meredith is a stereotypical woman. At first, she is very nice but later in the book she gets demanding and whiny. To make it short: She doesn’t know what she wants and she really got on my nerves. Dash completes the trio by being very positive and social. He is a funny guy without wanting to be funny. Dash is a wonderful addition to the book as he helps to lighten up the darker parts. In my opinion, this trio of main characters is very balanced. Sam, Meredith and Dash are surrounded by various other characters, each with their own little story to tell. The plot of Goodbye For Now is new to me. I like that Ms. Frankel introduces the pros and cons of a computer program that enables people to communicate with the “dead”. She shows that this is not something that everyone would think of as good and she also points out that serious problems can arise. Goodbye For Now combines an easy to read writing style with a serious topic. This is not your usual love story. (Even if the German title suggests it) Goodbye For Now is a book that will make you laugh, cry and think.